Our motor selection is focused on the stringent quality and price requirements of area original equipment manufacturers. When your name is going on a piece of equipment, it must have a quality that matches or exceeds your standards. Once satisfied with quality and service, OEM buyers require low prices, in line with the volume of items purchased. On all accounts, HTE can deliver. Excellent service also means being able to deliver motors on-time, from a large inventory. Delivering on our customer's needs, we provide data sheets and motor drawings (all ratings) as well as many engineering services. WorldWide Motors are specified by some of the largest HPU manufacturers and so they provide a 2-year unconditional motor warranty for Hydraulic Power Unit applications, and are suitable, and certified, for all flange mount H.P.U. applications. 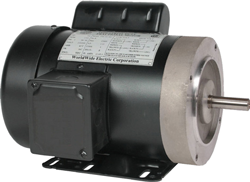 Motor Controls available for all motor ratings from 2 - 300 HP: across-line magnetic starters; reduced voltage soft starters; combination starters; and manual starters and switches. 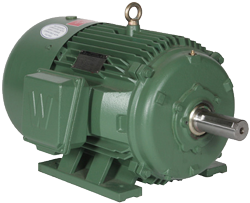 WorldWide Electric Motors are made in high quality, ISO9001 Certified facilities. WorldWide factories are vertically integrated to ensure high quality, consistent and steady flow of product from the factory to any demanding marketplace. HTE Automation is your resource for all your Worldwide Electric Corporation needs if you are located in Kansas, Missouri, or Illinois.